Anyway, he’s outstandingly famous now for a few of his more outrageous compositions, at least at the time. This small handful of works has ended up representing the composer more than just about anything else, and they were indeed historical and career-making. Let’s talk about him. Igor Fyodorovich Stravinsky was born on June 17, 1882 outside of St. Petersburg to a family of distant Polish descent. Eventually expected by his family to study law, he entered the University of St. Petersburg, where he basically, it seems, never went to class. Wikipedia says “he attended fewer than fifty class sessions during his four years of study. in 1902, then (the year before the cover photo for this post was taken, 1903), he went to stay in Heidelberg with Rimsky-Korsakov, who suggested he take private composition lessons instead of go to the St. Petersburg Conservatory. Some tragic circumstances seemed to work out in favor of Stravinsky’s musical career. His father died of cancer in 1903, and his university closed in 1905 after Russia’s Bloody Sunday, meaning he (probably fortunately) couldn’t take his law examinations and got a “half course diploma in 1906.” He continued studying twice a week with RK, a new father figure in his life, until RK’s death in 1908, at the age of 64-ish. He then decided to marry his first cousin, have a few kids and start publishing some pretty famous works around 1909. His biography on Wikipedia entirely skips over the work we will discuss on Thursday, and compared to what he did starting in 1910, it does pale in significance. Fortunately Sergei Diaghilev, that ballet guy, was present to hear a few of Stravinsky’s earliest works performed and ultimately commission him to score The Firebird. We will tell the story of that piece once we get to it, but it meant travel to Paris and Switzerland, the former where all the ballet and musical action was, the latter where he spent his winters. Summers were in Russia. After the enormous success of The Firebird, he churned out two more works for the Ballets Russes: Petrushka in 1911 and The Rite of Spring in 1913. After a terrible bout with typhoid and premiere of his first opera, he was able to return to Ukraine to grab some family belongings and get the hell outta Dodge before World War I began. Due to that and the Russian Revolution (and maybe, more likely than not, the second World War), Stravinsky wouldn’t set food on his home soil again until 1962. He suffered for a period since he was receiving practically zero royalties from his work in Russia, but, as it seems would be the case for most of the rest of his life, always managed to find wealthy patrons to help him out, and he continued to write fantastic things, including his Histoire du Soldat in 1918 and Pulcinella in 1920. Among one of his best supporters was French piano maker Pleyel (Chopin’s Pleyel). 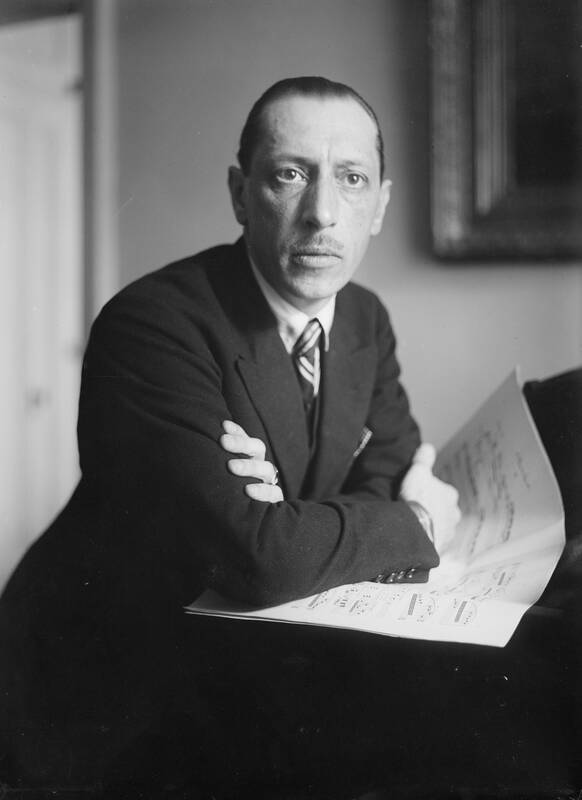 Aside from an affair and full-on double life all the way up to his first wife’s death of tuberculosis which also killed a daughter, things in Paris seemed to be fantastic for Stravinsky. After this rough patch, they moved to America, this time because of the Second World War. It seems somehow fitting that he moved to West Hollywood, and although people view him (for obvious reasons) as a Russian composer, and think primarily of his time in France, he spent more time in America (specifically living in L.A.) than he did in any other city. But having moved there at 57 years old, it was not an easy transition for him. Stravinsky’s professional life encompassed most of the 20th century, including many of its modern classical music styles, and he influenced composers both during and after his lifetime. In 1959, he was awarded the Sonning Award, Denmark’s highest musical honour. In 1962, he accepted an invitation to return to Leningrad for a series of concerts. During his stay in the USSR, he visited Moscow and met several leading Soviet composers, including Dmitri Shostakovich and Aram Khachaturian. He eventually moved to New York in 1969, living there for only a few years before he died of heart failure in 1971, aged 88. That’s quite a clean designation, and most people know of the works from the first period, for example, his ballets for Diaghilev that made such a splash. The very earliest of that early period, however, is perhaps not very well known, and it is with his opus one on Thursday that we shall begin. What, though, of his influence? Instead of describing the individual qualities of his musical works in specific musical terms, it shall suffice to say the man had an incredible command of the orchestra and a fantastic creativity for creating new and interesting sounds. His earliest pieces, under RK, were for large orchestral forces and while they (including our work Thursday) might seem like homework exercises, they have great merit of their own, and it wasn’t long before he used that same large orchestra to do fantastic things with harmony, rhythm, use of ostinati, all of these things creating a distinctly unique sound, such as in The Firebird or Le Sacre du Printemps (I suppose I should have been using the French names throughout). However, his neoclassical phase is as wonderful as any, and he shows his ability to pinpoint such exact sound and styles, like in Pulcinella, a wonderfully neoclassical work that gets its point across exquisitely, but still lets you know who its creator was and that it was not, in fact, written many centuries ago but is a work of the modern era. Stravinsky’s reputation in Russia and the USSR rose and fell. Performances of his music were banned from around 1933 until 1962, the year Nikita Khrushchev invited him to the USSR for an official state visit. In 1972, an official proclamation by the Soviet Minister of Culture, Ekaterina Furtseva, ordered Soviet musicians to “study and admire” Stravinsky’s music and she made hostility toward it a potential offence. It seems an almost insurmountable task to write a simple little article about a man who had such a large, varied career, and it’s a shame I’ve been at this so long and hardly even mentioned his name, but that’s finally being solved. The work of his we will address on Thursday is merely a place to start, and I am very excited to move on to more of his more enduring works. See you then.